Thank you for even being interested in this. 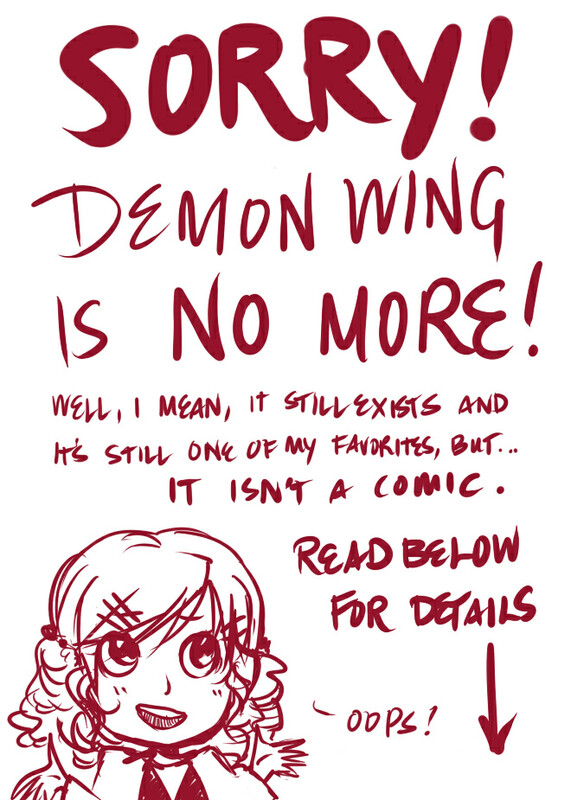 In truth, Demon Wing is one of my favorite stories of mine, and this comic does it very little justice. I have agonized in the past about starting over, just because I feel like I am building on such a poor foundation, but the problem is really much simpler. I have done quite a bit of thinking, and I'm tired of dragging this around. Even though I've tried to convince myself I want to, I think it's obvious I just don't like drawing comics like this. I love writing and I love illustrating, drawing character art, and making goofy doodle comics, but this is an absolute chore. It takes me too long, and it's time I could be using for other things that I enjoy far more. I still 100% intend to write this story out one day. I will keep drawing and loving the characters as I do now. DW is by no means dead. If you have been reading this somehow and still want to know what happens, I owe it to you. Please, don't be shy and shoot me an e-mail (above) or IM at Ameran Zsari on AIM. I will tell you the whole thing! And so, after 6 years and only 2 chapters, I say farewell to DW the comic. Thank you again everyone. Demon Wing is hosted for free on ComicGenesis.